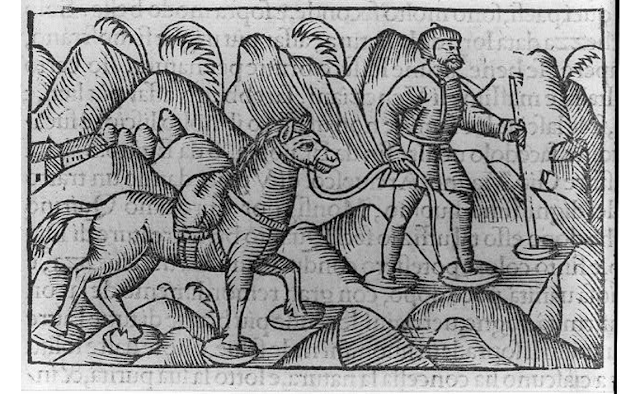 While researching my Lapp & Finn heritage, I happened upon the above image of a woodcut from a book published in 1565 about the history of northern people. 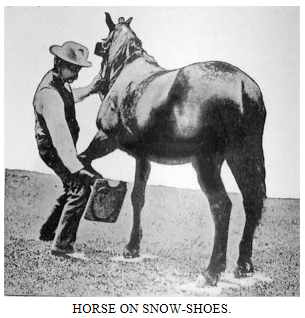 Intrigued, I soon discovered that North Americans also put snowshoes, and even mudshoes, on their horses when needed to distribute their weight over a larger area to keep them from sinking into the snow or mud. In 1888, James Mason Hutchings wrote In the Heart of the Sierras, a comprehensive work of natural and human history of Yosemite. 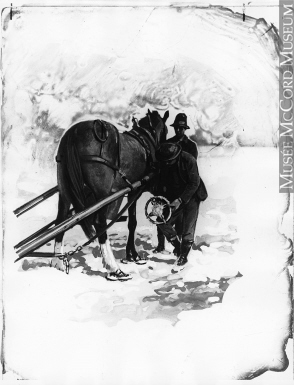 On the topic of traveling through snow, he experimented with wooden snowshoes on horses and came to a successful conclusion which he describes in his book in detail, including this next illustration which shows the underside of the wooden snowshoe. Concerning the snowshoes, Hutchings wrote that, "...Each animal seems to have an intuitive knowledge of what they are for, as of the duties expected of them; for, carefully lifting the foot higher than he would under normal circumstances, with a somewhat rotary and semi-oscillary movement, he throws his foot forward, and one shoe over the other, with such intelligent dexterity that they rarely touch each other...There is no confusion or even awkwardness in their use, although there is in appearances when seeing horses in such ungainly-looking appendages." 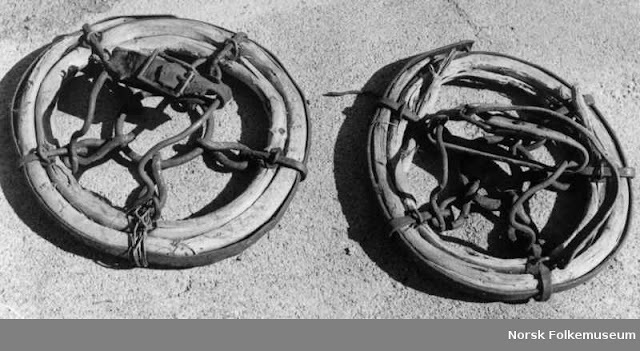 Similar horse snowshoes were used in the British Columbia goldfields as shown in this next image from the book, Prospectors, Promoters and Hard Rock Miners by Ian McLeod (with Holly McNeil). 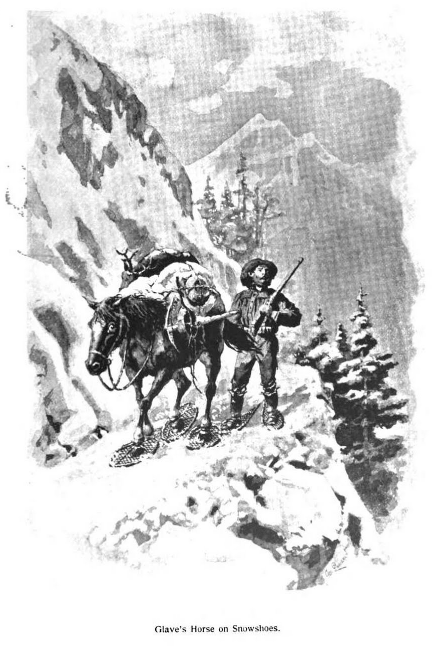 In the article, Alaskan Exploration in 1891 by John Bonner, published in The Californian Illustrated Magazine Oct 1891 to May 1892, Glave said, "They were the ordinary Canadian snowshoes, oval in shape, and rather small. At first the horses were awkward with them; but after a time they learned the trick of spreading their feet apart, and seemed to understand the purpose of the unusual hoof gear." 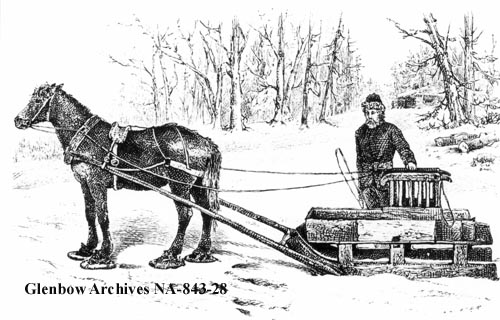 Around 1881, Edward Whymper engraved a winter scene showing a horse with a different type of snowshoe pulling a cutter in Eastern Canada. More open than the solid wood type, these round snowshoes were crafted of wood, metal and leather, based more on the traditional look than the wooden type. A close-up of the above snowshoe style is on display online through the digital website, of the Norsk Folkemuseum (Norwegian Museum of Cultural History) where they are called hestetruger (horse snowshoe). Similar to the underside of the solid wooden snowshoes, the metal chains and leather straps help to keep the snowshoes from slipping on ice and snow. Here's an image from the McCord Museum in Montreal that shows the underside of the snowshoe as a man puts one on the horse. Although this next image looks like a line of mounted antique baby shoes, what you're looking at are ca.1900 horse snowshoes displayed at the Canadian Museum of History. 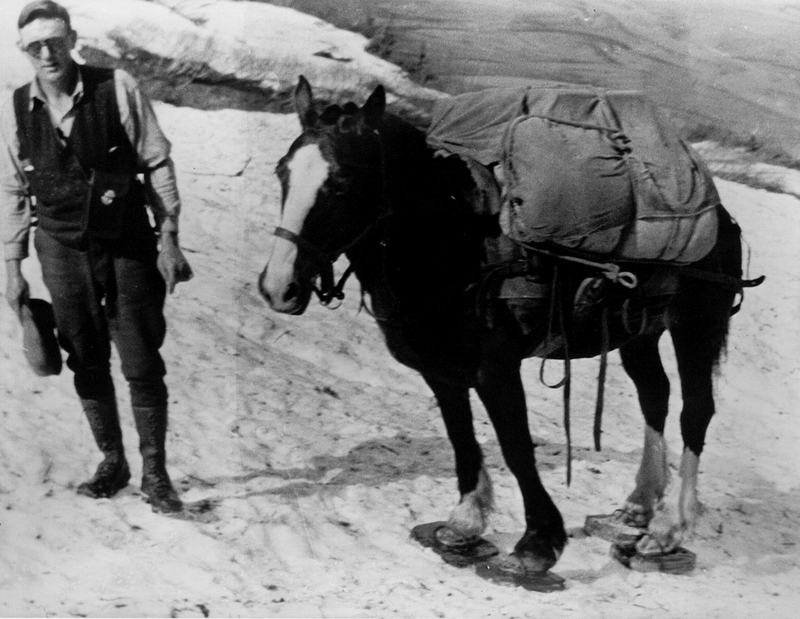 This type of horse snowshoe isn't as common as the others, probably due to the expense of crafting the leather "boots". I wonder if they were made for a particular horse, or could they be adjusted to fit different sizes? The history timeline of Bradford, Ontario, Canada, states that in 1872, "Bradford prospered with businesses such as lumber and mattress making using Marsh hay. Horses used in the harvesting of the hay used wooden snowshoes like clogs strapped to their front feet to prevent them from sinking into the marsh." Although the above newspapers are from Idaho, you can see that snowshoes were used in other mountain regions when the path became treacherous due to the weather. They weren't only used in the west, either. I've mentioned that they were used in Eastern Canada, but did you know they were used in New England as well? Check out the article, Collector's Antique Tools, Gadgets in Good Hands, about the Sheffield Historical Society in Sheffield, Massachusetts, and how it's preserving the past, including a photo of the actual size of a wooden horse snowshoe. Did you know that horses wore snowshoes? What do you think? Very interesting! I didn't know horses would perform with extra footgear. They are such amazing animals! Even my husband has not heard of them.